The Portuguese Republic, is located in the west and southwest parts of the Iberian Peninsula in southwestern Europe, and is the westernmost country in continental Europe. Portugal is bordered by Spain to the north and east and by the Atlantic Ocean to the west and south. Portugal is the most reliable wind destinations on the southern European coastline. Good wind, great weather, plenty of sun, stunning coastline dotted with quaint fishing villages and lively resorts with good facilities. The Algarve was, and to a certain extent, still is, one of Europe’s sun blessed and empty kitesurf paradises. There are more sunshine hours here than anywhere else in Portugal and even in January warm, sunny days are common. This is a bit of a catch 22 situation as the empty waves and excellent weather have turned some parts of the Algarve into soulless resorts pandering to package tourist hordes from across the continent. Thankfully this type of development is focussed largely in the Eastern Algarve and this is not where you will be kitesurfing. kitesurfing in the Western Algarve means sun, good wind, easy access through Faro airport, beautiful Mediterranean scenery and the added bonus of year round wind. The Algarve receives good wind all year round and for beginners there is always enough wind to kite. Atlantic storms deliver great wind conditions in winter, but thanks to the Nortada, the Algarve has great wind in the summertime too! 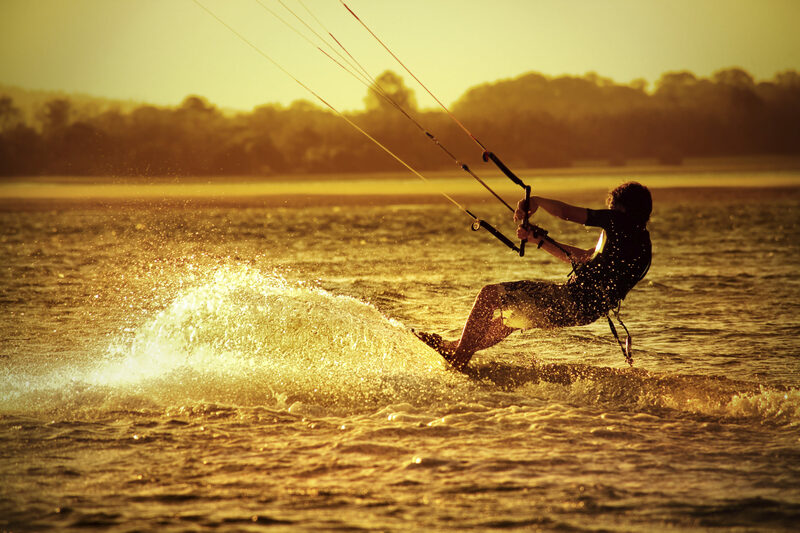 For experienced kitesurfers the Algarve has a lot to offer. In the summertime it’s primarily a freeride/speed destination – the Nortada blows regularly from April to September and it’s boardshorts-and-bikini temperature! In winter low-pressures deliver waves and strong south-west to south-easterly winds. Home to the PKRA World Tour, Praia de Alvor (Alvor beach) provides some of the best freeride conditions in the Algarve. The North wind or Nortada, is further strengthend as it is funneled through the Serra de Monchique mountains and by 2 o’clock in the afternoon it can reach 25 knots). The wind here is primarily onshore to side-onshore. in the Ria de Alvor (Alvor estuary), the conditions are generally perfectly flat because of the offshore wind and the Alvor East pier protection. The river mouth offers flat to choppy water and lots of shallow areas, perfect for beginners. One of the big attractions of kitesurfing in the Western Algarve is the incredible consistency of the wind. You can kitesurf all year and the beautiful beaches, steep cliffs, pleasant water temperature and spots that work under various conditions all make this area a great kitesurfing destination. The popular spots get crowded when the wind is good, but there are literally dozens of spots to be found with a little exploration.